Given that we are located in Hopkins, we do most of our chimney repairs and reconstruction in Edina, Minnetonka, Eden Prairie and surrounding suburbs. That said, we often travel outside of the western metro for our work. The Edina chimney discussed here is one in which the original mason used what was then a traditional cap design (Point B). There is very little slope and no overhang. 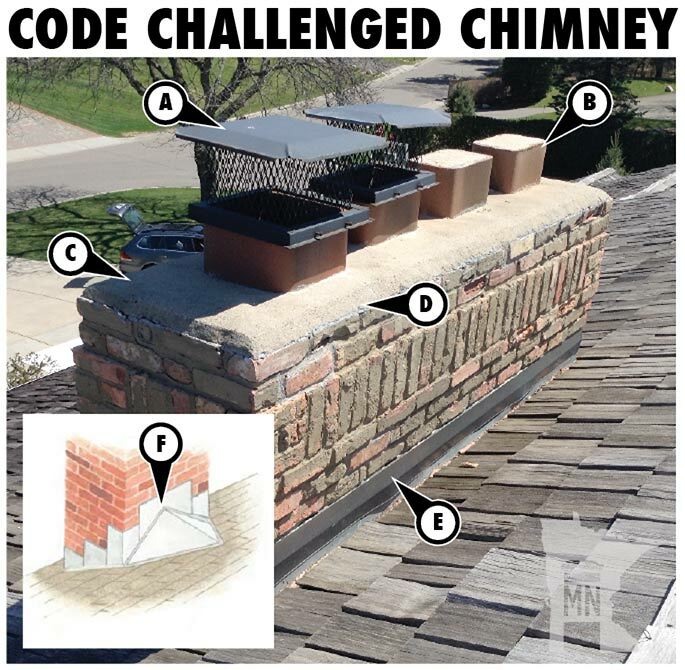 The result, as with many Minneapolis chimneys with this same design flaw, is that water wants to work into the bricks from above and cleave the material apart, usually through forces created during the freeze-thaw cycles. Many of the chimneys we repair in Edina are quite high and this one was no exception. It required three full stories of scaffolding, anchored in two locations into the home for stability. Point A illustrates a common problem. The passive clay flue liner, which is filled with mortar, is un capped and left to weather. We often see how water and ice destroys Minneapolis chimneys from this avenue. Ignoring the protection of the top of passive flues is a bad idea. The answer is simply to install a cap (Point F) on the passive flue. The screen shown at Point C is far better than doing nothing. I protects the flue from birds and squirrels, which have a tendency to fall into Minneapolis chimney flues. A number of our clients have told us stories of ducks, raccoons, squirrels and different birds who found their way into the chimney and into the home through the fireplace. Although screen caps offer some protection, they still do not protect the clay flues from damage through exposure to moisture and freeze-thaw cycles. For that you need a true flue cap (Point F). Most of our Edina chimney repair clients prefer to replace their old mortar chimney crowns with new, cast in place concrete crowns (also called ‘wash caps’). Such caps offer man advantages such as improved drainage and overhangs around all sides to promote the flow of water away from the bricks below. Point D is standard step flashing which is set into the bricks by the original mason. We seldom have to replace this flashing. When it does fail we normally recommend new step flashing that is interlaced with new roofing and then counter flashed with a riglet flashing. Point E shows a standard saddle that is hand framed and roofed, in this case with cedar shakes. 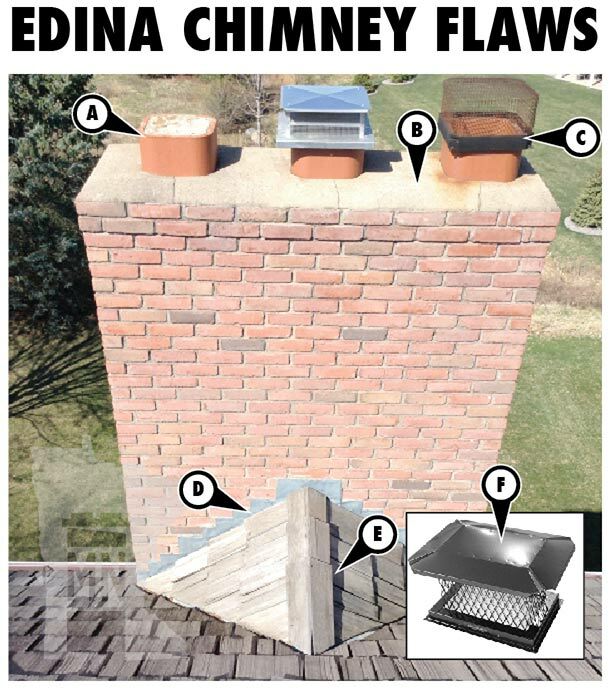 The cost of Edina chimney repairs such as this, where a new crown was installed as well as tuck pointing and chimney caps, was around $3,200.00. Most Edina chimney repair projects we perform cost an average of $2,500 to $5,000, depending on the scope of work and height of the job. Kuhl’s Contracting is a leader in Edina chimney repairs. Check out our work here. Here is a chimney we evaluate in Bloomington. It’s a standard brick chimney with common issues including bad mortar, missing flue caps and an improper chimney cap (otherwise known as a wash cap or ‘crown’). An interesting challenge on this chimney is its’ width. According to Minnesota Building Code, any penetration through a roof that is wider than 30″ needs a special assembly called a saddle, or cricket. The purpose of a saddle is to divert water to the left and right of a mass that passes through the roof. In this case, the chimney is over six feet wide, making the prospect of a saddle a bit of a challenge. An example of saddle is shown at Point F in the photo here. B – These flues should have caps such as those shown at Point A. Even though the flues are passive, i.e., they are filled with concrete, they should still have protection against the freeze-thaw cycle. C – The original cap was hand troweled in place and has no overhang. This is bad because it encourage water to seep between the cap and the bricks, eventually cleaving the brick apart and damaging the mortar through the brutal Minnesota freeze-thaw cycles in spring and fall. D – There is a crack developing at Point D and it will soon threaten the integrity of the chimney as a whole as water works its’ way in between the brick and the crown. E – As described above, this chimney is too wide to feasibly handle a code-required saddle. This owes mostly to the low pitch of the roof in combination with the width of the chimney. The most reliable resource for all things related to professional chimney repairs can be found at Kuhl’s Contracting, our parent company.